Calgary, AB: Red Deer Press, 2008. When everything stopped swirling, he let out a breath and slumped. Just at the edge of his vision, he caught a glimpse of something, a presence directly behind him. His chin shot up. He threw himself forward and away, turning in the air to face his attacker. The mist continued to swirl and he strained to see through it. Teeth…body…eyes. 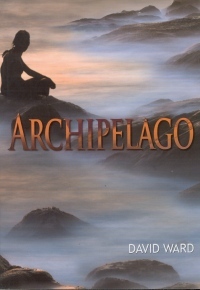 If you like the notion of traveling back in time, then Archipelago by David Ward is a must read for you. Archipelago, which is a fantasy and mystery novel intended for juveniles, takes readers back 14,000 years to the Charlotte Islands. It is based on the theory of the First Peoples crossing from Asia to North America. The characters are believable in this third person point of view story. Jonah is traveling the islands off the coast of British Columbia with his mom who is a photographer snapping photos for a travel magazine. As Jonah gazes over the cliff, he catches a glimpse of a girl off in the distance. This girl turns out to be Akilah. When Jonah and Akilah, who are both 12-years-old, encounter each other, everything changes. A mystical mist takes Jonah back 14,000 years to a land that is unbelievably different and a climate that is drastically colder. Archipelago is well researched and descriptive as it recreates the past. Since Ward grew up in Vancouver, he is familiar with the area in which this story takes place. The setting is well described, both in the past and the present. Ward recaptures what life would have been like 14,000 years ago, providing excellent descriptions of everything from what the land looked like and what animals existed, to what it smelled like long ago. And some of those smells are not very appetizing! Readers can almost taste Jonah and Akilah's supper of clams wrapped in a warmth of grass, lichen, and seaweed. The plot is jam-packed with plenty of unpredictable action. Jonah and Akilah embark on a dangerous quest together in search of The People. The pair are nearly killed by a bear and The Crossers. Also, the plot has many teachable moments. As Jonah is grieving over the loss of his father, he learns diverse things from Akilah such as how to survive both in the past and in the present, and some valuable advice about life in general. Jonah's character develops significantly from living in the past with his new acquaintance. Archipelago is a fairly easy read, although there are some complicated words. Young readers may not even know what the title means or how to pronounce it. Archipelago which is pronounced är'kƏpƏl'Ə–gō', means a sea with many islands. This is a great book to read for pleasure whether you are 10-years-old or an adult. Ward will take his readers on a nail-biting adventure back into time, and they will not want to put the book down until it is finished. Dana L. Coates is a grade six teacher in Norway House, MB.